My fiance seems to be the ONLY person I bake cakes for, I'm thinking it's time to change that tradition.. This year he asked for Fried Oreos, instead I made him a Red Velvet Oreo Cake! I found this recipe on Pinterest and just had to make it. Thank you Bakeaholic Mama for the amazingly delicious recipe! Here is the recipe, instead of making a 4 layered cake I made a two layered. Pre heat oven to 350 Greece and flour 2 8 inch cake pans set aside. Whisk eggs together, add in oil, buttermilk, vinegar, vanilla and food coloring. Set aside. Sift all of your dry ingredients together. In the bowl of your electric mixer on medium/low speed add in your dry ingredients to your wet 1 cup at a time until they are all combined. Split batter up evenly between all 2 cake pans. Bake for about 30 minutes or until a toothpick is inserted and comes out clean. Let the cakes cool for about 20 minutes then flip out of your cake pans onto cooking racks. In your food processor blend the oreos into crumbs. In the bowl of your electric mixer whip your heavy cream until soft peeks form. Add in your cream cheese and whip until they are combined. Mix in powdered sugar on medium/low speed. Wiping down the sides of the bowl as needed to ensure everything is evenly mixed. Fold in oreo crumbs. After cakes have cooled completely lay a thick layer of frosting on your first layer, top with a 2nd cake and then repeat frosting and alternate cake and frosting layers. After centers are frosted continue to frost the entire cake. If you have mini oreos place them along the bottom of the cake. Refrigerate for 1-2 hours. Bring a pot of water to a boil. Place a heat proof bowl over the top of the simmering water. Add in chocolate and heavy cream stir continuously until melted. Stir in sugar. It should be at a pourable constancy... if not you can add some water 1 tsp at a time until it is. Remove from heat and allow to cool for about 15 minutes. Remove cake from fridge and pour chocolate over the top. You can work the chocolate down the sides with a rubber spatula to create drips Place in the refrigerator and remove it 1 hour before serving. My fiance was surprised when he cut into the cake, he definitely didn't expect Red Velvet. We all enjoyed this cake, it was truly delicious! Is it July 31st yet? I can't wait to bake him another cake! Chocolate is my favorite. Thanks for sharing. Oh my this looks heavenly! Will have to try this one for sure! Yum thanks for sharing! Could there be a more delicious cake recipe? The answer is no! I can't wait to make this. It looks super yummy. Wow this looks amazing, thanks for sharing! This looks really good. I recently made a oreo cheesecake that turned out pretty good. I am going to save this page in my favorites for later. Dang Alyssa! What are you trying to do to me??? This looks amazingly good! Would never have thought to add Oreos into the mix with a Red Velvet cake. Nice! That looks so delicious! 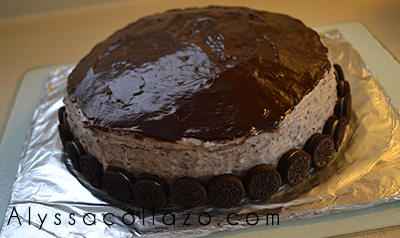 As an Oreo lover, I approve of this recipe :)) I really need to try re-creating this one, but I doubt it can look as good as yours. Wow! So yummy. Red velvet cakes are always so moist. Got to love this recipe! Oh good God. I'm not sure if I hate you, or love you. Thanks for an awesome recipe!!! There goes my diet lol. That looks amazing. Thanks for posting this. Ok since red velvet cake is my favorite and you topped it with chocolate frosting you are the winner of The Greatest Cake Baker That Ever Lived Prize!! This really looks good! 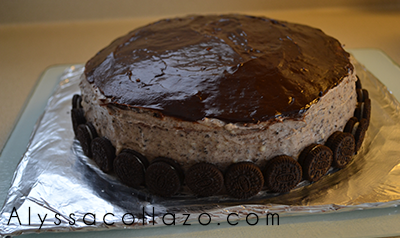 I am a huge fan of velvet cakes and mixed with oreos it doesn't get much better than that. Can I be your friend, lol. Looks so delicious! This looks amazing and sounds so good. 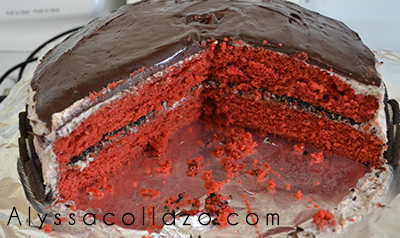 I will have to try making this red velvet oreo cake. Thanks for sharing the recipe. My sister is in love with red velvet cake! So I'm saving this recipe to make it for her! Yumi! I had a red velvet cake for my wedding. Was made by one of my friends. We all loved it! This looks beyond amazing! Two of my favorite desserts together! Goodness this cake looks delish! Thank you for sharing. Oreo desserts are one of our favorites. Oooh, lucky fiancee. He must really enjoy all the goodies you make for him coz that one looks divine! oh my goodness that look so good. i'm bookmarking this for later. A red velvet Oreo cake?? Oh my....there are no words for that. Thank you so much for sharing. This one looks pretty good. I want to learn baking for my hubby too. I love red velvet and this recipe should be bookmarked! Lol I was surprised too! HAHA! I want to try this too! Wow that looks fantastic! Oreos are one of my favorite things to eat ever! This looks really yummy!! Perfect for family gatherings! Looks so yummy! Anything chocolate is good enough for me. Thanks for the recipe. I love red velvet cupcakes! I would totally give this a try. That cake looks very delicious. I would like to try a piece. This is an interesting mix to put together, but we only eat gmo-free food. Oh my goodness, I wish I had that right now! It looks incredible!